L & S Bait Co.
Help Unknowns / Unidenti... Florida Lures ? The numbering system on these should hopefully give them away as to who, where, etc.. I have picked some of these up at different times, which is why I figured that they must be Florida lures ? Those are interesting. 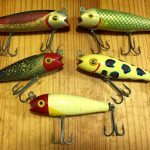 Cool baits, would love to know if you find out any more information on them. FATC St. Pete show this weekend. RE: Nice find today... check it out. Copyright © Old Florida Lures - All Rights Reserved | Site by Virtual Dreamz, Inc.